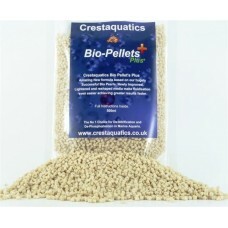 Brand New Marine Bio Pellets Plus. After 6 Successful years of producing our world famous Bio Pearls, Crest aquatics have listened to customers and have greatly improved our Product. They now come in a smaller pellet form, same great recipe just a different shape and size. Following several Months of testing and adjusting, crest aquatics have come up with the best shape, weight and size of pellet to allow for much easier fluidisation in your reactors. Under the microscope the rough cuts also hugely increase the overall surface area which in turn improves seed time and bacterial and nutrient uptake. Taking all of this into consideration means we can now use a reduced flow through the reactor which not only saves you on pump size etc, but greatly increases contact time which allows for a superior end result. They have also proven to be a great hit in the smaller Nano reactors. We hope moving forward our pellets are every bit as successful as the original Bio Pearls were. Our Newly improved Pellets work in the same way as our Bio Pearls below and come with updated instructions in every pack. Crest Aquatics Bio Pellets have been specifically researched and manufactured for use in marine aquaria. Our pellets are manufactured to the highest quality standards from a pure polymer source. Our pellets have been tried and tested and have proven very successful. 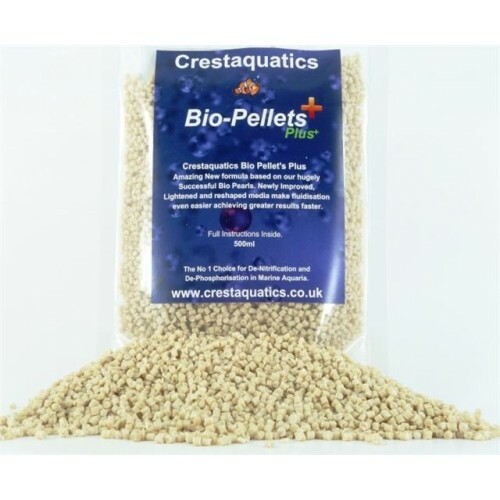 Crest Aquatics pellets work by supplying a breeding ground and food source for de-phosphorising and de-nitrifying bacteria. They do that by providing them with the essential nutrients needed for successful growth acceleration. This massive acceleration of beneficial bacterial growth, promotes rapid clarification and purification of the water column, Hence reducing unwanted Phosphates and Nitrates. These unwanted nutrients are converted to a state that can be easily exported via a skimmer. Our Bio pellets Plus are produced in the same factory as other pearls on the market, and are done so to the same rigorous and high quality standards. They have been rigorously tested in the marine environment and rapidly aid in the transport of Phosphates and Nitrates from a system. Our Promise to you: Our pearls have been 100% tried and tested and have sold hundreds of thousands world wide - you won't be disappointed! Our pellets are also selling on the high street at several local retail outlets and one major chain store !Please do not hesitate to contact us and we will be more than happy to help and answer any questions. Check out our perfect feedback from Hundreds of happy customers!